670,000 people can’t be wrong. That’s how many participants connected to U-M BlueJeans conferences in the past year. New data about U-M’s use of BlueJeans cloud-based conferencing service illustrates impressive growth year-over-year. See the infographic (PDF). 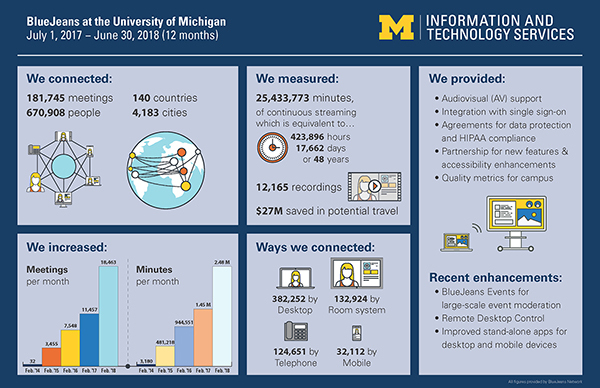 The data, which is anonymized and provided by BlueJeans Network, provides a summary about how the service was used by the university community over the course of the previous U-M fiscal year (July 1, 2017–June 30, 2018). Over 181,000 BlueJeans meetings were held, a 58% increase over fiscal year 2017. That includes both videoconferences and audio-only calls via BlueJeans. Those meetings accounted for a staggering 25.4 million total minutes, an increase of about 68%. There were even 8,300 newly registered users—people who schedule and host the meetings. BlueJeans Network estimates $27 million saved in potential travel—the airfare and ground cost incurred if each meeting had been held in-person. Planet Blue would be proud: That equates to roughly 32,000 metric tons of potential carbon emissions saved. Also compared to last year, there were about 70% more endpoints—the devices people use to connect to meetings, like desktop and laptop computers (57%), room systems (20%), telephones (19%), and mobile devices (5%). 35% of meetings are joined using BlueJeans’ dedicated apps, the method recommended by ITS. Standalone installers are available for Windows, MacOS, Linux, iOS, and Android. ITS negotiates the campus contract for BlueJeans. The contract was recently renewed and includes continued access to BlueJeans Events (formerly Primetime) at no extra cost to the university community. Learn more about BlueJeans at U-M at its.umich.edu/blue-jeans.